Every event is full of coordinated activities to keep children engaged and entertained. While you're out to dinner or shopping your kids are with us playing dodgeball, dancing the night away, making cool crafts, getting their face painted and hanging out with friends. We have a new activity starting every 15 to 30 minutes, so there's always something to look forward to! Children are closely monitored by our staff. All staff are background checked. There is also an off-duty uniformed Police Officer on duty at every event. For each event, parents designate who will pick up their child. That person will need to bring a photo ID to present at pick up. We also encourage children to leave personal cell phones and electronics at home. The manager on duty has a phone that children can use to contact parents at any time. We're just $10 - $15! That admission fee covers all games and activities for the night. There's never an extra charge for a special event such as laser tag! We also have a concession stand where your child can use tickets purchased at our ticket booth for things like pizza, chips, candy, slim jims, soda, water and Gatorade. There is also a selection of novelty items like glow necklaces and bracelets for sale. Tickets are $0.25 cents each and never expire. On average, children spend between $5 - $6 per event on concession items. Throughout the season we have various special guest appearances from some of the areas biggest names! We host live performances from local aspiring stars and others! If you'd be interested in performing, please contact us for more information! All of our events are themed for maximum FUN! themes include Lego® Nite, Minecraft™ Nite, Sports Nite, and more! 29 years, millions of children! Our number one goal is to provide each and every child who enters our location a positive, fun, and safe environment for them to just let loose and have fun. This basic goal has allowed us to provide a positive place for millions of children over the past 29 years! 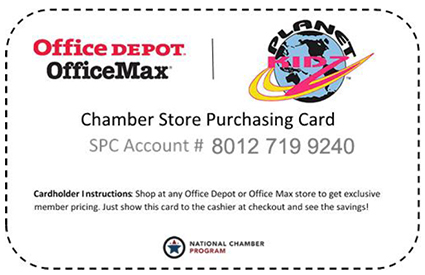 We're always looking for new partnerships to help those in our communities, and one example of that partnership is with Office Depot / OfficeMax which gives you access to steep discounts on almost any Office Depot / OfficeMax retail and online purchase! You can start saving now, just click the above coupon or click here! The first time your child attends, you will need to complete our membership form. It's available at the door or you can print it here from our website and bring it with you. Plase call your location manager, they will be happy to talk with you about the details. Birthday parties at our events are easy, hassle free and so much FUN! Do you screen the music? Yes, we start with popular radio-edited music and then apply the 'mom test.' There are often songs that children request that just don't meet our standards. Our DJs use an approved play list and we constantly screen music to see what's appropriate to add. The music is fun, upbeat and easy to dance to! Can children bring a phone / iPod / mobile device etc...? We prefer that children leave these items at home and cannot be responsible for lost or stolen items. Children are very active during our events, and phones can fall out of pockets or be broken during a game. There is a phone available if children need to reach you during an event. We strive to accommodate every child and there are many special needs children who thrive in our environment. Children must function in a group setting and not require 1 on 1 supervision. We cannot accommodate children who refuse to stay in a designated area or one whose behavior endangers themselves or others. If your child has a food allergy, please let the manager. Also, please discuss with your child which foods are acceptable for them to purchase & consume. You are welcome to leave medication or inhalers, epi pens, etc with the manager on duty. Is there a cut-off time for entrance? Nope! You can bring them anytime during event hours. Can I pick up my child anytime? Absolutely! If you need to pickup your child before normal close, we'll gladly walk you through the program to locate and pick up your child. Please note closing times for your location as we do charge a fee for late pickups. Can a child from outside the district attend? Yes, any child in the age range for your location may attend! The safety of every child is our primary concern. We utilize a single entry & exit, make sure only our staff are interacting with kids, have each child signed in and out, check a photo ID at sign out, and have an off duty police officer or private security on site for the duration of each event. If there is ever an issue you will be contacted by the manager. If you need to reach your child during an event, please call your locations primary contact number found here on our website, or on the events calendar. All of our staff are trained professionals over the age of 18. Each staff member must go through a rigorous background check, and at many locations staff consists of current school district employees. Can someone else pick up my child? Yes, we have many parents that car pool and have one parent drop off kids and another pick up. On the sign in sheet, there's a space to indicate the name of the person who is picking up your child. Just list the persons name there (or give us 2 options if you're not sure). At sign out, we'll check ID to make sure each child goes home with the right person. Can we use concession tickets from prior weeks? Absolutely, they never expire! As long as they're recognizable, we take 'em! How much money does my child need? Admission is $10 - $15 depending on location, and concessions are completely optional. On average, children spend $5-$6 at the concession stand. This varies by location, please contact your location for more information. Ready for that night off?